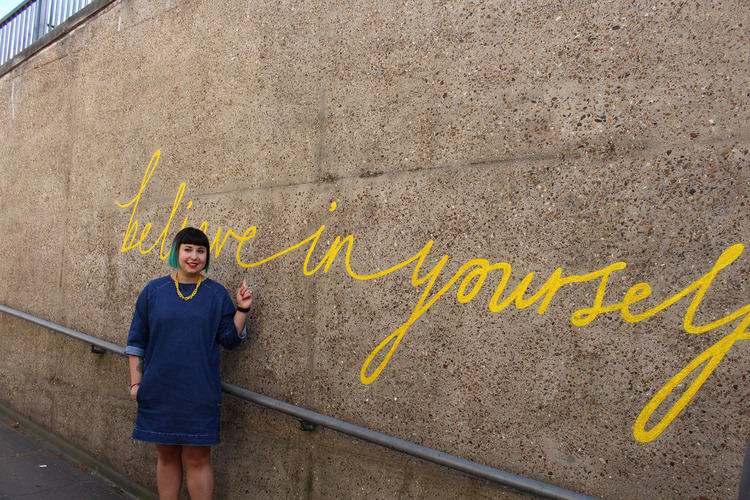 Project completed whilst working at make:good, commissioned by Bow Arts Trust. 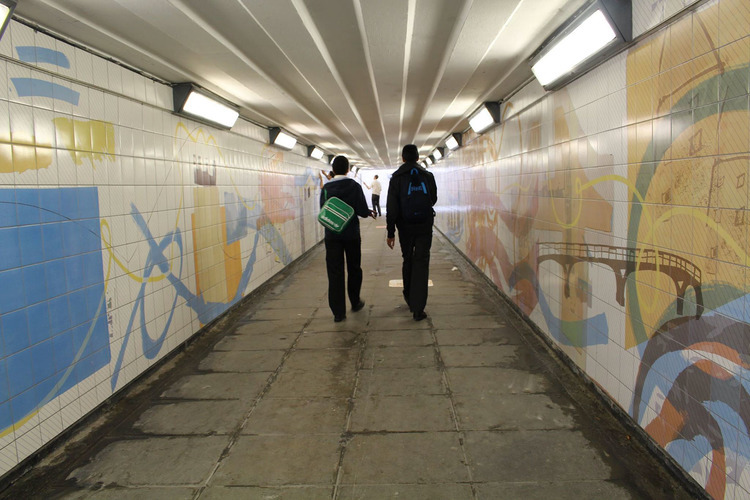 The brief was simple, to create some way-finding interventions that would lead Bow Schools’ new influx of pupils safely under the A12, using the Empson Street underpass. 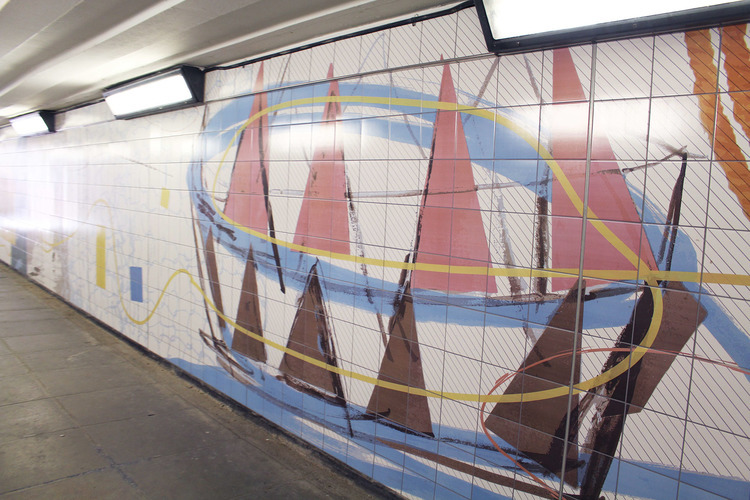 We devised a creative workshop to help the boys visualise and direct the artwork for a subway installed in Bromley-by-Bow. On this project there are a number of components, each linking into the other. Firstly - the semi permanent way-finding clues, designed to lead people to the underpass to safely cross beneath the busy A12 to the new school site. Secondly, the walls of the underpass needed something of a spruce as they was looking tired, dark and didn’t exactly inspire any sense ‘safety’ for the hundreds of young people soon to be using it daily. And finally, a design for the new school’s entrance gates, welcoming the community and catching the eyes of the many passers by on foot and by car. Throughout this process I worked to involve the current schools’ ‘Core Commissioning Group’ of students who have significantly helped inform our brief. 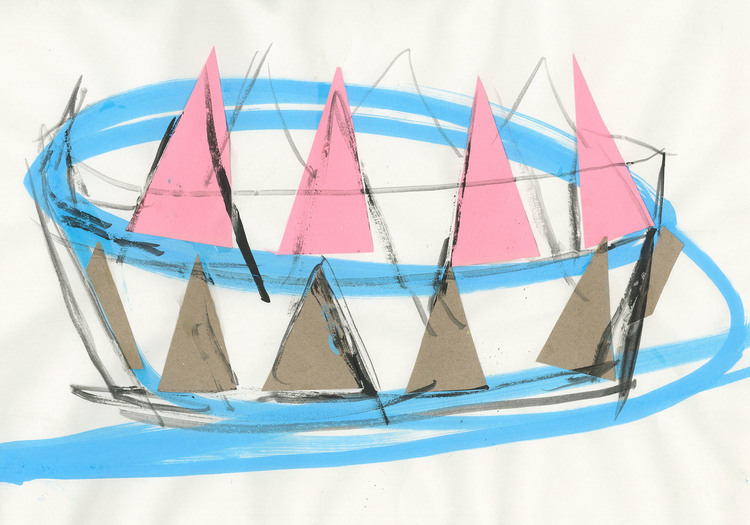 We began with an activity titled ‘taking a line for a walk’, experimenting with how our journeys could be used as a tool for drawing and mark making. Also using photographs of the route to help students map their ‘emotional journeys’ at each stage of a walk, words such as ‘excited’, ‘motivated’, ‘safe’ seemed to be the most significant vocabulary chosen by the group. Ready with bright orange postcards, I visited Bow Church, Bow Ideas Store, Poplar Harca lunch club, local shops, Stebon Mellor primary school fete; asking what ‘words of wisdom’ or guidance ‘would you give to your 13 year old self?’ We collected a whole range of responses from to the strong and simple ‘believe in yourself’ to the amusing and characterful; ‘every little makes a muckle’ from a 96-year old former teacher of a nearby school in Bow. 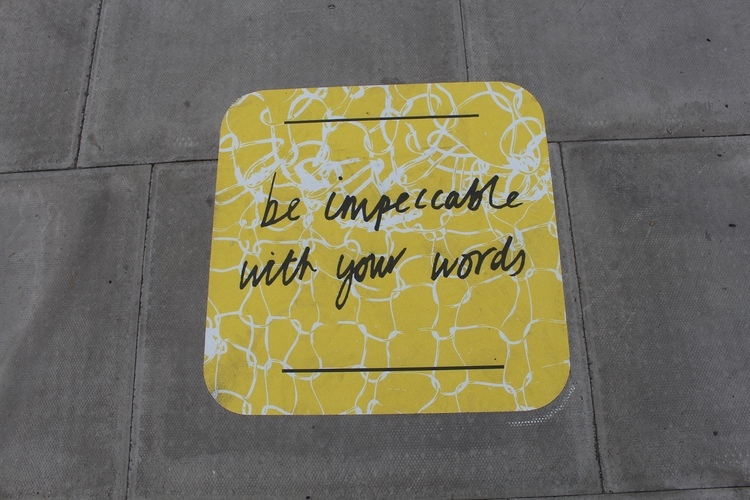 These words are to form a number of bold pavement interventions offering motivation and guidance along the route to school, under the subway and along the road. Each 600 x 600 mm square giving it’s own unique local words of wisdom to help inspire people along their way to the school and beyond. On a very hot day in August we donned our hardhats to climb to the top of the new Bow School to photograph it’s surrounding skyline. A mixture of iconic buildings like the Olympic stadium and less grand but familiar architecture like newly built blocks of flats, punctuated by cranes- the Bow skyline is certainly an ever-changing montage of shapes and outlines that we wanted to capture in our subway artwork. Using the process of collage, we created an abstracted vision of the landscape, which just as the boys stated in their brief, must be constantly unraveling to reveal something different each time you looks at it. For some, sections are instantly recognisable such as the iconic Balfron Tower, for others they initially perceive shapes and then later see churches, locks and structures emerge. This element of the design is perhaps what makes it so exciting. It develops and changes much like the real thing. I used these buildings to create a number of cut out collages in the studio. 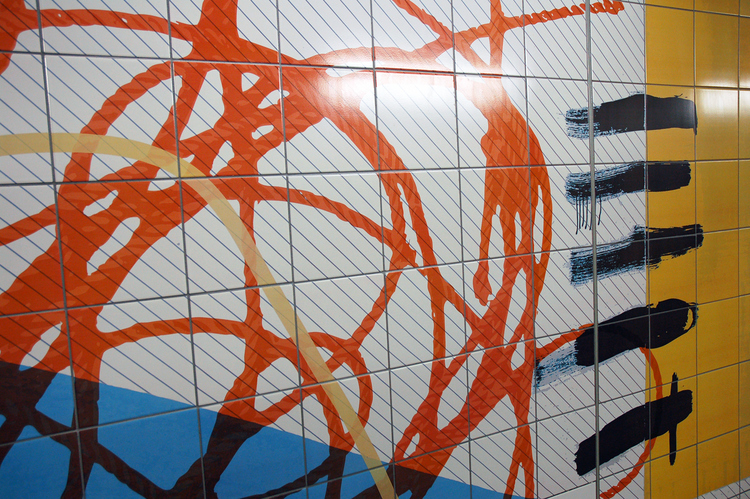 The sense of a dynamic line that evolves and goes on a journey, inviting curiosity, movement and forming it’s own pattern is something at the centre of my design for the subway. The line moves and weaves through the buildings, climbs and descends towers, flows under bridges and crosses train tracks and tunnels. The line acts as the energy and movement that holds the entire artwork together, and creates a curiosity that drives people to follow it to see where it may lead. The design needed to have a sense of depth and character that captured the textures of place and patterns formed by people. So I was thrilled to discover a very lovely and eager group of local knitters who helped create a number of unique textures for our collage. These small knitted squares were themselves another version of ‘a curious line’, and went right back to the beginning where we tried to ‘take a line for a walk’ and see what naturally formed. 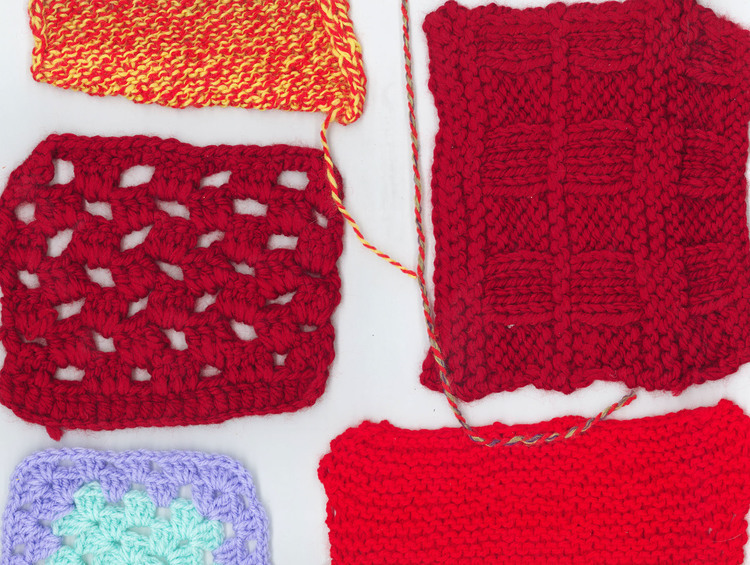 These intricate and rich textures created by people with stories just as elaborate and fascinating led us on our own surprising journey into a relationship with knitting. We then invited to Core commissioning group of teenage boys along to learn a thing or two on how to knit from the lovely ladies at the Brownfield cabin. Experimenting with odd alternatives like wire and string meant that for that brilliant hour, everybody was learning, experimenting and taking their different materials for a curious journey to create something new and unexpected. 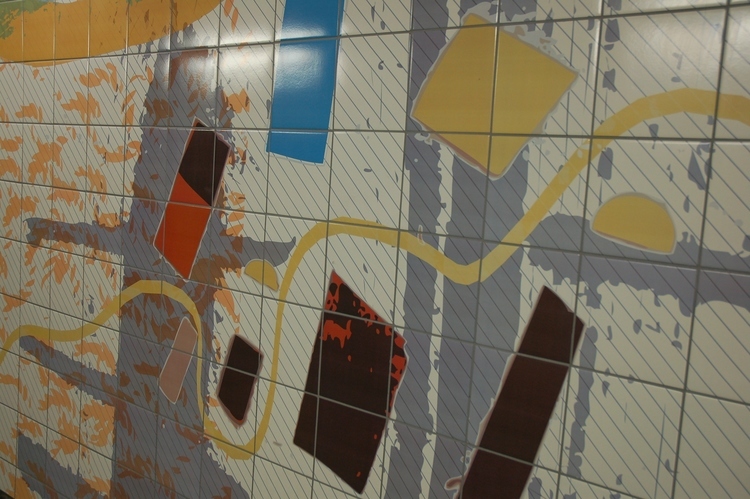 The underpass was officially launched in June 2014 by artist Michael Craig Martin and Director of Tate Modern Sir Nicholas Serota with help from Bow school students.